Why consider “The Refuge” Storm Shelter? – You want a tornado shelter that you and your family will feel safe and comfortable in that doesn’t require a lot of maintenance. – You want a tornado shelter where you don’t have to worry about bugs, snakes, frogs or other critters, not to mention mold or mildew from water seeping problems with metal or concrete underground shelters. – You don’t want a tornado shelter that may make you hesitate to use it when the time comes to take shelter from the storm – that moment could be the difference between life and death. – You want a tornado shelter that has been properly tested by the Texas Tech University Wind Science Center to withstand an EF-5 tornado so you don’t have to worry about your family’s safety during severe weather. —> Or DOWNLOAD a “REFUGE” Storm Shelter brochure by clicking here. Like the Lifesaver Storm Shelter, the Refuge Storm Shelter is a quality fiberglass underground shelter that will not leak, rust, corrode or mildew. With the technology and materials of today, fiberglass is the obvious choice for underground storm shelter installations of the future. Fiberglass is the preferred material because it offers safety, affordability and longevity, as it is waterproof and rot-resistant, and can withstand the tests of time so that your family can take shelter from the storm in “THE REFUGE” for years to come. You can rest assured that this shelter will stand the test of time. The Refuge Storm Shelter has been around since before the turn of the last century and will be around through the next millennium and beyond, providing the same peace-of-mind protection from tornadoes and damaging winds as it did for you from the day it was installed. Safety is the most important consideration in the design of “THE REFUGE” underground storm shelter. – High-production capability means Refuge storm shelters are likely available when other manufacturers may be swamped! – Higher ceilings and lower-angled steps means a more spacious interior providing a feeling of comfort and security with ample head and leg room and easier access in and out of the Refuge storm shelter! – Molded-in shelf space for emergency supplies such as water bottles, batteries, flashlights, blankets, first aid kits, etc. – Like the Lifesaver: No rusting, No cracking, No Rotting – Easy to maintain and clean! – Lightweight, simple and hi-tech, yet relatively quick to install (in as little as 2-4 hours)! —–> (Another top-quality underground fiberglass tornado shelter is the Lifesaver Storm Shelter – click here for more info. I am interested in a tornado shelter. I live in Northern Kentucky. Do you install here and do you have financing? James, yes we can install there in Northern Kentucky. Call us at (256) 258-WIND (9463) and let me know what type and size of storm shelter or tornado safe room you are interested in and your exact location so I can get you exact pricing information for you. For financing, call our financial specialist Nan at 256-772-7773 (once you have the final price of course) so she can give you the different options available. Thanks for visiting James! I would like to know what the difference is between the lifetime storm shelters and the refuge storm shelters. Also, if you live in Madison County, why is there a extra $200.00 charge? Thanks. Julie, first of all that $200 charge for Madison county no longer applies. I actually created a video comparing and contrasting the slight differences between the Lifesaver and Refuge storm shelterson our FAQs page. They are very comparable shelters however, with only slight differences. Both are great quality shelters. I live in Waverly, Al., about 14 miles from the Auburn and Opelika area, Hwy 280 used to run straight through my town, which has a population of 120. Do y’all deliver and install your shelters this far south, and are the portage costs high for the distance traveled? I live, essentially, alone, so the smaller models would be my interest. Thanks for the info. Hey Anderson, just click on the PRICING link at the top of the page and it’ll show you all the prices for installing a storm shelter or tornado safe room where you live. Thanks! What is the price for the Refuge 2 ? Hey David, the Refuge 2 starts at $5700 installed if you’re in the Huntsville or surrounding areas. If you’re further out, check out our PRICING page for full details. Thanks! 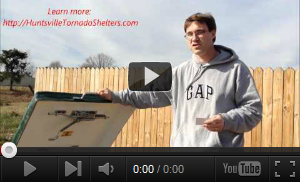 How can I be considered for a free storm shelter? We will be giving away a free storm shelter at the Grand Opening of our new Huntsville show room which will likely coincide with Tornado awareness week in February of 2013 I believe. Stay tuned for details by entering your details on the top right side of the page (and get FREE WeatherCall @Home service). That really does look like quite a safe thing in case of a tornado. Here in the midwest it is not quite as needed, but I like the sealed features so you don’t have to share your space with all the local bugs and pests. Yes. Call us or check out the PRICING link for exact details. I’m really impressed with your writing skills and also with the layout on your blog. Is this a paid theme or did you customize it yourself? Anyway keep up the excellent quality writing, it’s rare to see a great blog like this one nowadays. Charline, I customized this website myself. Here’s a good article if you’re interested in easily setting up your own high-quality blog: Blogging 101 Thanks for your comments! I live in Decaur, Al. to be in a closet or in a pantry. Can you do that? Yes, assuming your home will be built on a slab. We need to know the height of the eventual slab and where you want it and then we can go ahead and install one for you so that the lid and vents are in the right place after the concrete is poured. Just fill out a contact request at the top of the website or give us a call. Thanks Justo! This post is a lifesaver! (No pun intended.) I assume this will be installed by the professionals from your company, correct? If it’s easy to install then I can get my brothers to do it for us. This is a great product, Hans. People should invest in this, especially the ones who often get hit by the storm.